Annabel Karmel is the UK's No. 1 children's cookery writer. The author of 37 books and the UK's 4th best-selling cookery author , only just behind Jamie Oliver, Delia Smith and Nigella Lawson. Now Annabel has turned her attention to the whole family, taking on the challenges of cooking around busy family life. Annabel's Family Cookbook contains 100 easy to follow recipes ranging from everyday family dinners and weekend get-togethers, light meals, snacks and lunchboxes. In the introduction, Annabel talks about her love of food and her recipe for successfully feeding the whole family. 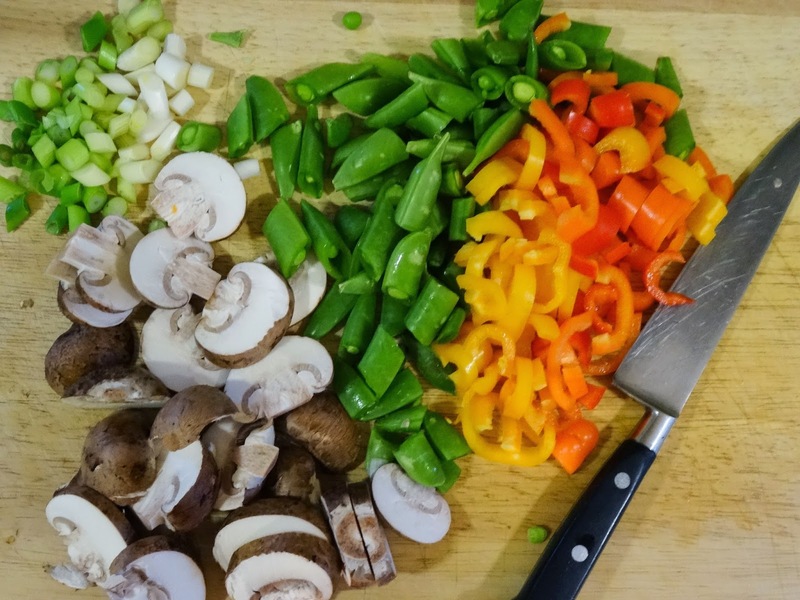 In Quick and Easy the dishes which caught my attention were Bow Tie pasta with peas and prosciutto, Tasty 10-minute Prawn Stir fry, Potato and Chicken Rosti, Chicken Schnitzel and Pork Stir-fry with Sugar Snap Peas (this is the dish I chose to make, scroll down for the recipe). Everyday Meals includes one of my favourites, Nasi Goreng, but I was also taken with Chicken Fingers with curry dip which would go down well with the chicken nugget brigade, but so much healthier to make your own. Vegetable Tagliatelli is a feast for the eyes and Honeyed Lamb Cutlets look sticky and delicious. Meatballs, drumsticks and more chicken goujons, this time marinated in buttermilk, Worcester sauce, soy sauce, paprika and garlic before being coated in breadcrumbs, what a treat! I'll definitely be trying Broccoli with Chilli and Pine Nuts, what a great way to jazz up broccoli. Moving on to Light meals, snacks and lunchboxes, there are some classics like Welsh Rarebit and Chicken pasta salad, but also some standouts like 'My Favourite chicken and potato salad' which I plan to make at the weekend. For the more experienced cook, recipes for Club Sandwich and Tuna Melt seem a little superfluous, however I'm sure they would be used by someone new to cooking or simply as inspiration when the question comes..."What's for Lunch?" Those of you familiar with my style of cooking will know that I am a 'Prepare Ahead' sort of cook and Annabel provides a chapter for this type of cooking too. Beef Bourgignon, Lara's Lasagne, Tarragon Chicken Casserole and Spiced Butternut Squash Soup compete with Mini Fish Pies and Veggie Burgers on my list of what to cook from Annabel's Family Cookbook. Weekend Get-togethers are a perfect opportunity to extend the dining table, dust down the emergency chairs and invite family and friends over. I'm sure they would want to return again and again if you served them Squash, Pea and Sage Risotto, Roasted Chicken Breast with Sweet Peppers, Courgette Gratin or Baked Sea Bass with a side of Roasted Vegetables. Bakes and Sweets are ideal for getting the kids involved in the kitchen, Annabel has some simple treats to share. Her Chocolate Rice Krispie Squares are full of dried fruit and nuts and perfect for children to make with only a little help. A slightly more advanced sweet is the Chocolate and Toffee Marble Cheesecake, it's a no bake cheesecake full of delicious ingredients. Being a big fan of apricots, I'll be making the Apricot Cookies just a soon as I have my oven back, they have white chocolate in them too. The recipes in this chapter range from crumble to fruit ice lollies. The standout for me was Easy Chocolate Orange Mousse, only a few ingredients, a simple technique and a dinner-party worthy dessert. This isn't a book that will push the boundaries of your cooking skill, that's not what it's for. It's for families who want to eat well but don't always have a lot of time. It's also a good aide memoire, when you are stuck for inspiration, giving you everyday family dishes you may have made before, perhaps with a different sauce or way of serving. Good clear photographs and styling, showing you what you are aiming for. Simple, well set out recipes using everyday ingredients and usually a fairly short list of ingredients too. The recipe I cooked lived up to its description, was quick and easy to make and tasted delicious. If you have a lot of 'everyday' cookbooks you will probably have many similar recipes. There are many more recipes containing meat, fish and chicken than vegetarian alternatives, which given the likelihood that one or other of your family are likely to choose not to eat meat, is rather a shame. The same can be said for gluten free and dairy free, I would have like to see these highlighted as there are some recipes which would be suitable. These are good, well-written recipes that clearly have been tried and tested with families in mind. There's plenty of variety (bearing in mind my comments re non-meat eaters and special diets) and, despite my family having grown up and left home, I am likely to be dipping into this book quite often. First I have to say that I used chicken because that's what I had in the freezer and secondly that I halved the ingredients and made this dish for two people. Although Annabel has not suggested it, I think that Tofu or Quorn would be an ideal substitution for the meat in this dish. 1. Toss the pork or chicken in the honey and season. Heat a frying pan until hot. Add 1 tbsp of the oil and quickly brown the meat. Set aside. 3. Mix all the sauce ingredients together in a bowl. 4. Return the meat to the pan with the sauce. Toss everything together and fry for 2-3 minutes. 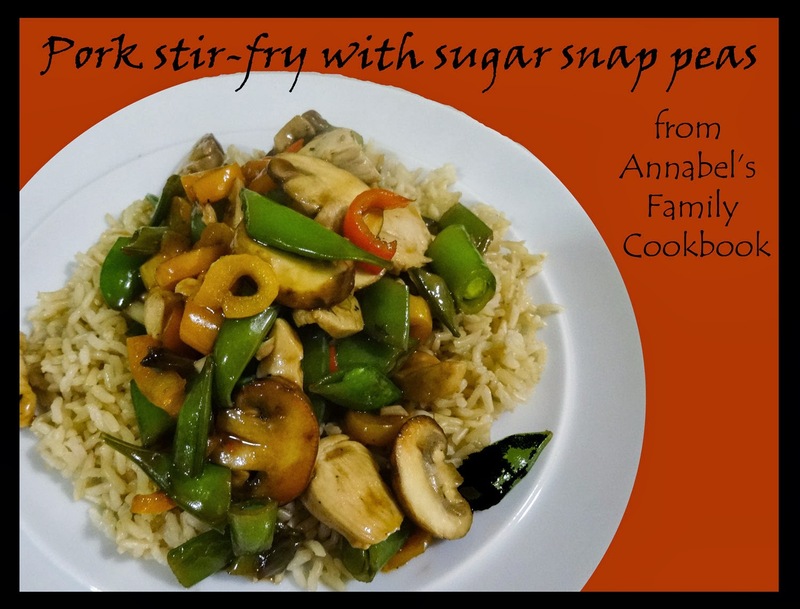 Annabel describes this as "A speedy stir-fry for busy weeknights. This dish can be made with pork or chicken - both will taste delicious". 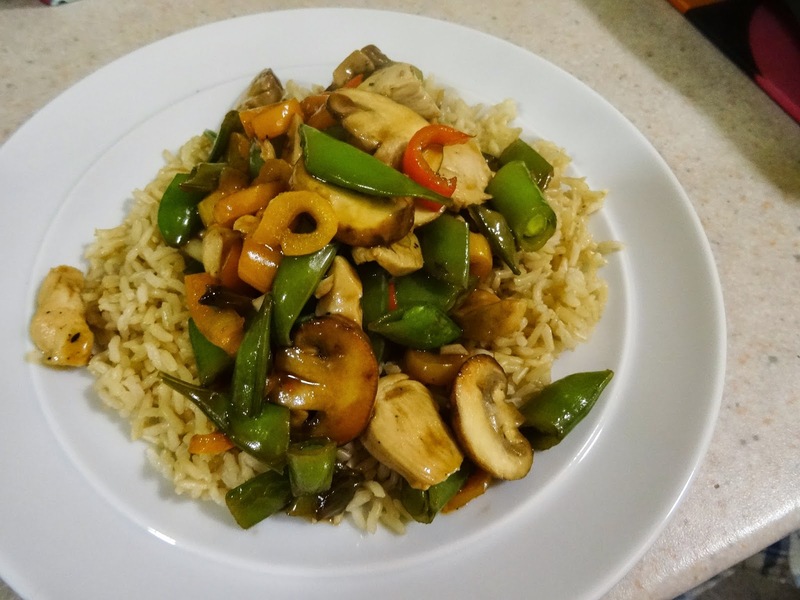 I must confess, I am usually a bit disappointed with stir fries that I make, but this one was full of flavour, the honey and the sauce really made the vegetables and chicken sing. 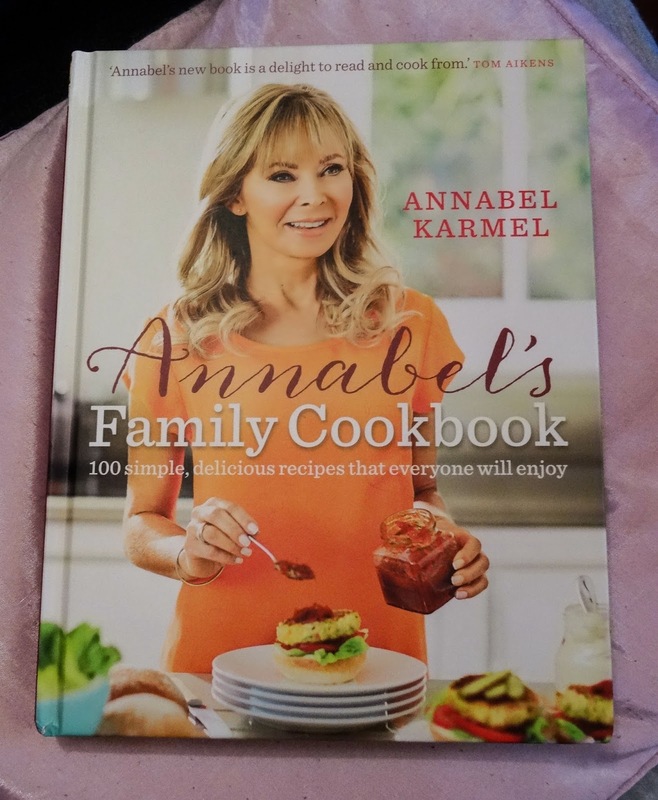 I have one copy of Annabel's Family Cookbook by Annabel Karmel to giveaway, please follow the directions on the Rafflecopter widget to enter. This giveaway is only open to UK residents. I received a copy of this book for review, I was not paid and all opinions are my own. I'm definitely going to try that sauce Janice, thanks for sharing! I LOVE the look of this stir-fry Janice and the book looks great too! I've seen her products in the supermarket and have heard good things about her. Another great review Janice. I love books like this that are about real cooking rather than lots of fancy stuff most of us are never going to make. I've made apricot and white chocolate cookies a few times and they are a firm favourite. I can't believe she has 37bbooks. Goodness. I used her books when learning what to cook for the mini chefs. My favourite family recipe is my mum's tomato soup. Looks lovely good luck to those who enter! There's so much you can do with stew, isn't there? It's never the same twice. She came along with her books after my boys were past that stage, but I've looked at some of them and they are very good. You are welcome, let me know how you get on. Yes, they work really well in a stir fry. Thanks Karen, it's a keeper! I didn't know she had products, must look out for them. Thanks Tina. It is good to have achievable recipes and different types for different occasions too. Yes, that's quite an achievement. That sounds good, have you shared it on your site? I love that too Lauren. Tea and Toast with style!